It’s been a busy spring and early summer here at Invitations4Less.com. Much of Jeanne’s time has been spent selecting and adding new invitations for all of our invitations lines. 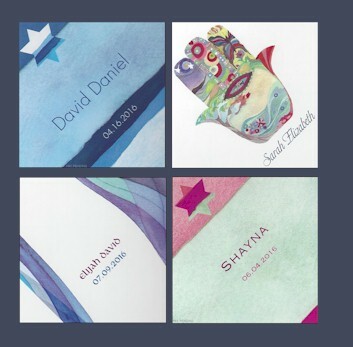 This year is somewhat unique for our Bar and Bat Mitzvah collection as most of the printers we work with have debuted new albums. 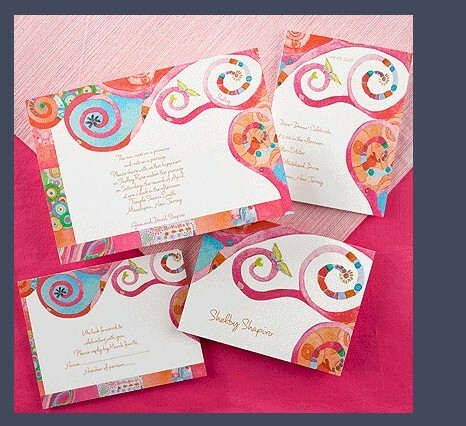 Some of our latest invitations are designed by Shell Rummel. Rummel’s designs reach across the age spectrum of young and old. Her richly symbolic artwork is full of color, vibrancy and beauty. 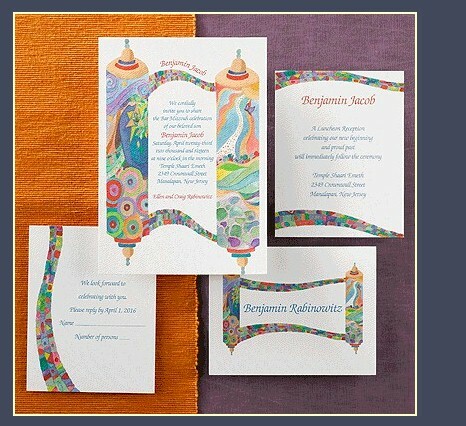 Her designs are unique with style and Jewish tradition. Carlson Craft is printing her stunning designs and we are proud to offer them on our site. Our Bar and Bat Mitzvah families are already submitting rave reviews. 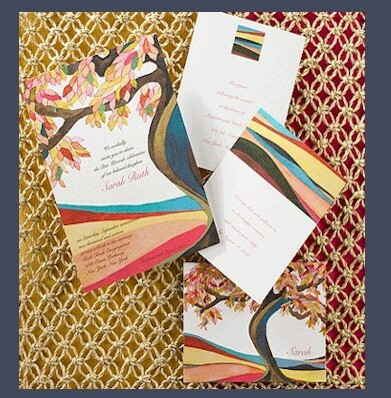 All of the Shell Rummell invitations are offered with double envelopes. An array of colorful liners may be added to inner envelopes for an extra charge. Hebrew names and blessings may be added to these invitations. We have a Hebrew typesestter on staff to assist with the Hebrew design and translation. The invitations from this collection are paper with 30% recycled content. A wide variety of ink colors are offered with this collection as well. These beautiful designs are also being offered on beverage and luncheon napkins. These napkins are elegant, full of colorful and may be personalized. For questions or assistance with ordering these newly added napkins, please contact us. As Rummel’s invitations have been added to our Bar and Bat Mitzvah collection, it’s been exciting to receive our customer’s feedback. Add to our blog by letting us know what you think! Michaela has been with Invitations4Less.com since 2003, showing off her customer service skills to a variety of stationery consumers. Michaela is mom to two active pre-teens and spends her free time bike riding, boating, hiking and enjoying family time.